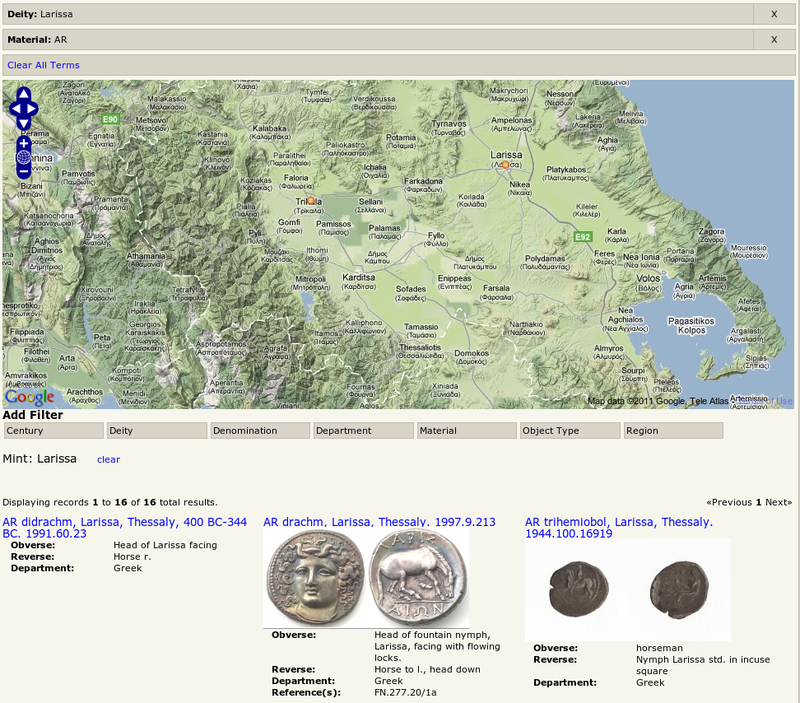 The American Numismatic Society collection represents one of the largest numismatic datasets in existence. Such a large collection of digital objects lends itself to the potential for meaningful quantitative analysis, including the geographical distribution of coins based on a variety of physical and categorical attributes. Mapping coins over time and space is useful to scholars of economic history, art history, and many other disciplines for which coins are an important resource. For example, how have depictions of deities changed over time in mints of Syria? What do Flavian coins found in a late third century English hoard indicate about monetary circulation and the perceived value of centuries-old coins? What do issues depicting Concordia indicate about political conditions in the Roman Empire at that particular time? Dynamic visualization based on researchers' queries can lead to hypotheses that would have otherwise never been considered. 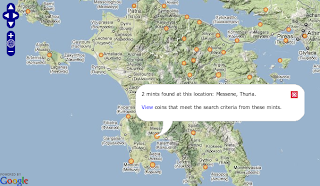 Currently, we are building a mapping interface for the ANS collection that utilizes a variety of free and open source tools: Apache Solr for the search index and OpenLayers for the display of maps. Ajax calls connect the two together to form a seamless interface. When coins are indexed into Solr, the script checks nomisma.org's authority list of mints to acquire the latitude and longitude of each's coins mint (when possible). OpenLayers then builds its point layer with a KML file generated dynamically from the Solr search results for user's query. A list of facets appears under the map, providing the user with the ability to filter results based on constraints like deity, material, denomination, issuer, and region. OpenLayers enables the clustering of mints found within close proximity to each other, simplifying the interface when zoomed out. The popup bubble in the image displayed above contains the names of the mint or mints within the layer feature. 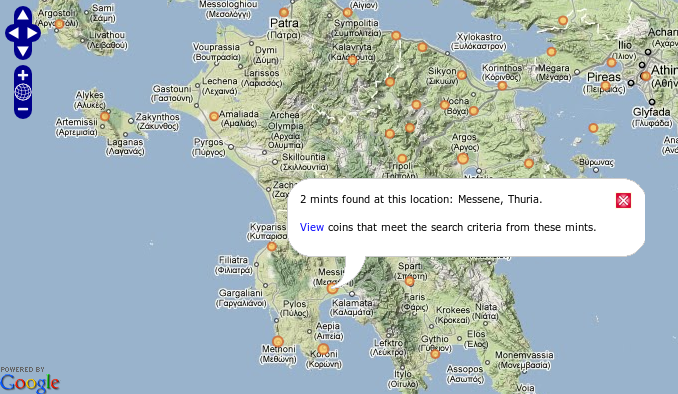 The user can click on the "view" link to load the list of coins that meet the search criteria in the space below the map. An issue from Tricca depicting Larissa, the nymph named for her city of origin. Unusual? While the user is able to filter results by century, a future version of this application will feature a time slider for more precise temporal visualization. The functionality of the ANS mapping widget will grow considerably in the following months and will be available with the release of the new collection interface in mid-March.